Fully integrated. Fully optimized. Fully supported. Save time, money, and enjoy peace of mind by letting Tiger be your one stop-shop! You won't have to spend time integrating cards, formatting storage and figuring which drivers will give you the best performance. In addition, we will also assist with your initial installation to make sure everything runs smoothly and as expected in your environment. And, as an added bonus, you'll get to save on your annual maintenance! Tiger Serve|1U is a fast and flexible server that is perfect to host any Tiger FAN workflow engine software module. Tiger Serve|1U supports up to two PCIe extension slots for either storage and/or client connectivity. Tiger Serve|2U is a fast and flexible dual-node server that is designed to host Tiger Store+HA along with any of the Tiger FAN workflow engine software module. Tiger Serve|2U contains two hot-swappable motherboard modules; each supporting up to two PCIe extension slots for either storage and/or client connectivity. Tiger Box|1U is a fast and flexible storage server that is perfect to host any Tiger FAN workflow engine software module. Tiger Box|1U4 supports 4x 3.5" drive bays and Tiger Box|1U8 supports 8x 2.5" drive bays. Both models support up to two PCIe extension slots for either storage and/or client connectivity in addition to accommodating up to two Tiger Exp|3U16 expansion chassis. Tiger Box|3U16 is a high-performance storage server that is designed to host Tiger Store along with any of the Tiger FAN workflow engine software module. Tiger Box|3U16 contains 16x 3.5" drive bays as well as up to five PCIe extension slots for storage and client connectivity, and can accommodate up to four Tiger Exp|3U16 expansion chassis (expansion kit required). Tiger Exp|3U16 is a high-performance expansion chassis that is designed to work in conjunction with any of the Tiger Box storage servers. Tiger Exp|3U16 contains 16x 3.5" drive bays and connects over SAS. From easy installation to easy maintenance, the Qualstar|Q24, |Q48 and |Q80 LTO tape libraries are designed to be Simply Reliable™. Feature-rich and compact, they can connect over SAS or Fibre Channel. 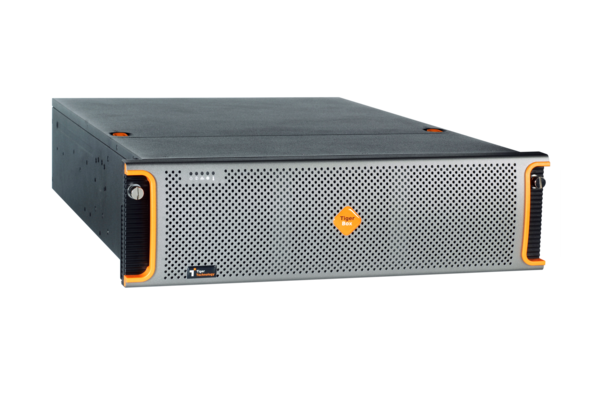 The Qualstar|Q24 offers capacities up to 144 terabytes (native) and 360 terabytes (compressed) in a compact 2U; the Qualstar|Q48 offers capacities up to 288 terabytes (native) and 720 terabytes (compressed) in 4U and the Qualstar|Q80 offers capacities up to 1.2 petabytes (native) and 8.4 petabytes (compressed) with the addition of up to 6 expansion modules (totaling 7x6U=42U). These are perfect companions to Tiger Bridge-T. Note: When using Tiger Serve|1U and Tiger Serve|2U, SAN performance is only bond to your storage infrastructure. We have field installs with sustained throughput to SAN clients exceeding 20GB/sec (160Gbps) and performing multiple streams of 4K DPX color grading. For LAN clients, performance would be the same as Box|1U8 or Box|3U16 with SSD. - Pre-install and configure APC PowerChute software for your Uninterrupted Power Supply (UPS). - Pre-install and configure Qualstar drivers for tape library control. Get in touch today. We'll take good care of your business. (1) Stream count measured in our lab using typical video editing application. Please use as ballpark figure. Tiger cannot guarantee you will get the exact same numbers in the field as results will vary based on your particular application, traffic pattern and network topology. (2) All Fibre Channel and 10GbE optical connections include SFP+ of 10BASE LC-type. The 40GbE connection does not. (3) Performance per port. These numbers represent read performance measured in our lab using practical test cases and Tiger Client driver. Actual performance may vary in the field based on your applications, motherboard, drivers, HBA, switch, protocol, etc. Also note that these numbers are also bound to the total performance capabilities of your storage unit. (4) An iSCSI initiator must be ordered separately. (5) Tiger Store|FCT Fibre Channel Target module must be ordered separately. Note that Tiger Store|FCT module is only available when ordering a Tiger appliance. (6) All Tiger appliances come with dual, hot-swappable power supplies and it is possible to order additional system memory. (7) The Tiger Box|3U16 requires the addition of an Expansion Kit (see below) in order support up to four Tiger Exp|3U16 expansion chassis.